Facilitate unparalleled results for your clients (and yourself) as you earn your third certification as a COR.E Dynamics™ Specialist. Accelerate the growth of your coaching business when you apply the COR.E Dynamics™ principles to your own pursuits. Hear from niche experts on how to systematically and easily explain your offerings to prospective clients so you can grow your business faster. Receive coach-specific training in the SCOPE™ assessment mobile app—a unique tool that gives clients feedback on their level of engagement and enthusiasm for producing a particular outcome or completing a specific task BEFORE they act. Shift your client’s energy in minutes, anytime, anywhere, and see their results on your personal dashboard. You’ll receive over 200 downloadable PDF assignments and explorations you can assign to your clients, saving you time and money not having to create your own programs from scratch. You’ll learn how to build them into client programs to enhance the client experience and expand your business model. Focus your advanced expertise in one or more of the following key areas. These four topics are the cornerstones of any iPEC specialization or uniquely tailored niche. Through this extended deep dive into essential topics, you’ll accelerate the growth of your practice and optimize your client outcomes and experiences. Deepen your ability to recognize and shift common stress factors, energy drains, and challenges of corporate and executive leaders. Master coaching language and add extensive tools to your toolkit to support this specific audience. While you might initially think of sports performance and athletes, this niche supports the success of all performances in life. Powerfully support the success of anyone engaged in measured performances, including singers, professors, and sales professionals alike. While there are transitions in all areas of life, this niche focuses on the major ones—typically changing jobs, careers, geography, and relationship status. Deepen your ability to recognize and shift common challenges to support any type of transition. Deepen your ability to recognize and shift the common challenges of health issues, weight loss struggles, new exercise plans, and serious diagnoses. Master coaching language and add extensive tools to your toolkit to support optimal health. 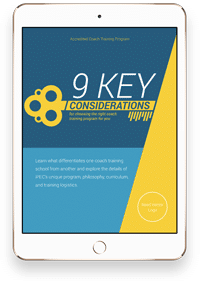 Receive actionable insight on how to select a coach training program that positions you for success.